The Angels have been really looking forward to Halloween all year! The Grand Halloween Party is one of the biggest festivals on Sapphire and will be held from Oct. 28th to Nov. 1st. Dress up in new Halloween outfits, enjoy the spooky decorations, and play the new Pumpkin Lucky Bar for amazing prizes! Have you decided on what to wear for the Costume Party on Hallow’s Eve? The brand new Suit Red Hood could be perfect for you! Female characters will be transformed into the innocent Red Hood, but not so innocent is Death’s Reaper that she wields! Meanwhile the Prince was cursed by a witch, and is now tormented by a savage beast that lurks within him! What will happen if these two encounter each other? Wicked Howl (Red Blessing): Increase entire squad’s ATK by 15% of character’s ATK and increase END by 15% for 2 rounds. Savage Assault (Red Thunder): Deal (ATK*210%+70) damage to enemy with the highest ATK and reduce their Hit by 50%; deals 30% more damage against targets with negative status immunity. What you see flashing across the sky on Hallow’s Eve are not shooting stars, but Witches riding their magic brooms! The Witches’ most common familiar, the Black Cat, is coming to Sapphire! This Battle Pet has taken her owner’s pointy hat and mantle, and is ready or the biggest Halloween party of the year! Black Bats (Lv. 1): Deal (162%+50) damage to all enemy targets and reduce their healing received by 33% for 2 rounds. Staggering Strike (Lv. 1): Deal (163%+50) damage to a random enemy with a 50% chance to immobilize them for 1 round. The new Pumpkin Lucky Bar event awaits you to take a shot! 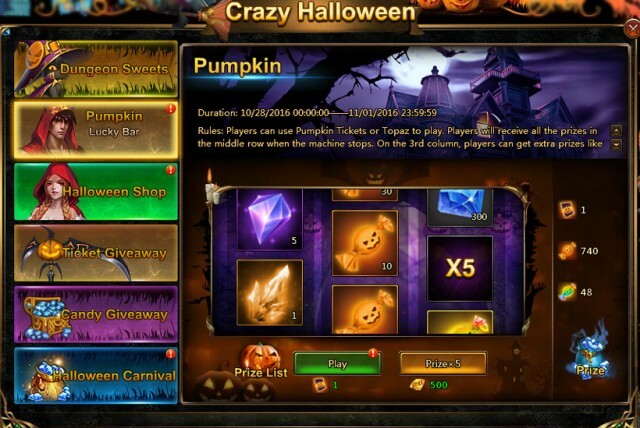 Pumpkin Lucky Bar is played similarly to regular slot machines, but there’s no need to match. Players will get all the prizes shown in the middle row when the machine stops! Also on the 3rd play, the last column can have extra prizes, such as ×2 and ×5 prize multipliers, making your prizes multiply! Log into League of Angels II from Oct. 28 to join in the 5-day long Halloween Party! The party never ends on Sapphire! Play now for free!